Gaza City (Palestinian Territories) (AFP) - Gaza farmers exported produce to Israel on Thursday for the first time since the Jewish state imposed its blockade on the Palestinian territory in 2006, officials and an NGO said. 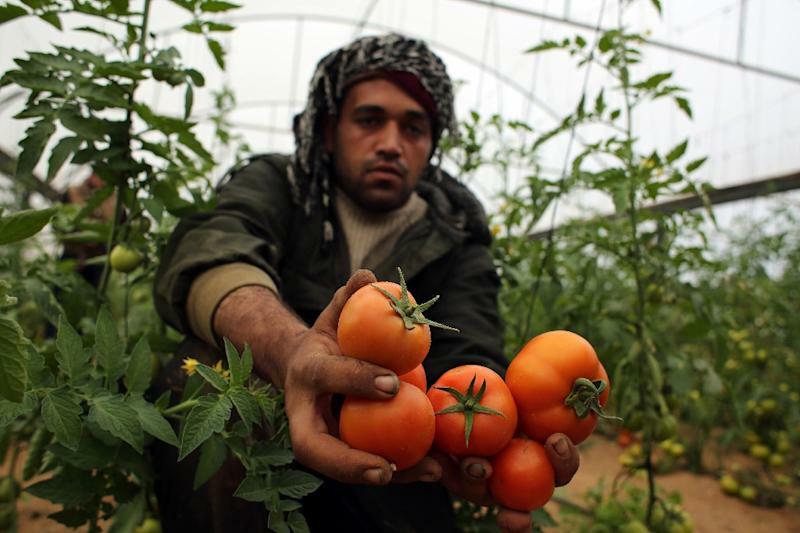 Gaza's agricultural sector, once a key revenue source, has for eight years been paralysed by the Israeli blockade, which controls movement of goods and people to and from the coastal enclave. Israel announced last week it would allow Gaza to export produce, both to help its farmers and to satisfy the religious needs of Israeli ultra-Orthodox Jews. Every seventh year on the Jewish calendar, observant ultra-Orthodox cannot consume produce grown by Jews in Israel. Three truckloads of tomatoes and aubergines were allowed through the Israeli-controlled Kerem Shalom goods crossing, Israeli rights group Gisha said in a statement -- the first produce in eight years to leave the coastal enclave that is home to 1.8 million Palestinians. Israel's coordinating body for government policy in the Palestinian territories (COGAT) said around 32 tonnes of the vegetables had crossed through Kerem Shalom. COGAT said in a statement that "future stages" of export would let through up to 1,500 tonnes of vegetables per month. Gaza is in financial dire straits, and home to 100,000 displaced Palestinians after a brutal summer war between Israel and Gaza rulers Hamas that killed nearly 2,200 residents of the Strip and 73 people on the Israeli side. The international community has warned that without rapid reconstruction of the decimated territory, another war could be just around the corner, and has stressed that apart from humanitarian aid, Gaza's economy needs to be resuscitated.